"Have we visitors from Space", a heading from the May 7, 1952, issue of LIFE magazine about the UFO incident in Washington D.C. The answer is an unequivocal yes, according to Lou Baldin, the author of the book. 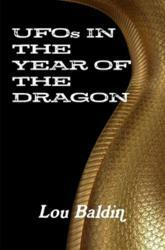 UFOs in the year of the Dragon, is based on Lou Baldin's life experiences. Baldin takes the reader on a journey where Aliens have penetrated Earth defenses and have integrated into the human populations mostly unnoticed by the people of the world. According to the author, foreign and domestic military and covert government agencies do know and large amounts of money has gone into their coffers so that they can try and keep tabs on what the Aliens are doing on Earth and how much of a danger they represent. Baldin states that governments around the world secretly monitored and attempted to infiltrate suspected groups of Aliens that have embedded themselves into critical areas of human affairs in various branches of governments during and after the Second World War. Baldin asks, "Did the American military and the government leaders forget to mention such tidbits to the public?" The author, Lou Baldin, then answers his own question, "Purposely they have." And Baldin states that the military has little knowledge and understanding of the Alien intruders and therefore can't breach a subject they virtually know nothing about. According to Baldin, the US military and the government adhere to the same protocol as do all the leaders in the world concerning UFOs and the extraterrestrials visiting Earth, they deny that such things are possible or that they even exist. Baldin says that if people knew that there are Aliens from other worlds coming and going as they please on this planet and the armies of the world are helpless to do anything about it, panic and anarchy would ensue—or perhaps, humans would enter into a new age of awareness. In his book, Baldin writes that rogue Aliens battling other Aliens do so behind human conflicts and wars. Most such wars have ended up benefiting humans with technological advances in the aerospace, military and communications industry, according to Baldin. Baldin said that the defeat of Hitler in 1945 was a huge technological boost to the two superpowers Russia and America, who virtually fought over the German technological spoils after the war, which also spawned the Cold War for the very same reason, Alien technology. According to Baldin, Russia and America captured materials and German scientists (even before the war was over) that had the knowledge to transform a pastoral world into a Space Age world virtually overnight. Baldin said that not only has the military benefited but also pharmaceutical companies have reaped a profit from the hidden Alien invasion. According to Baldin, Aliens have brought with them bacteria and other biological materials that have infected humans and animals with viruses that continue to mutate and contribute to various ailments and diseases afflicting humans. Lou Baldin has written several books and has a blog about extraterrestrial beings and some of the reasons they have a primordial interest in humanity. The comments in this article are the expressed opinions of the author of the book, "UFOs in the year of the Dragon. Loved the book Lou, one question what was the insight/revelation you got in it regarding why humans are the way they are throughout the galaxy? There is no such date for LIFE magazine. I think you mean "Have We Visitors From Space?" in the April 7, 1952 issue of LIFE, which can be viewed here and in Google books. being a maker of asses between u and me, i just thought you decided to call ol milty lee to shorten the typing load. Azrael, reading the headlines should tell us plenty about the human condition. The worst part is that that are millions of other planets with humans like us all over the galaxy. Kai, not really a tease, procrastinator, I am. That book and others have laid in wait for years. Some are no longer worth publishing. My excuse for not getting around to them. Terry, that explains why I always forget my wedding anniversary, which is on April 7. Scott, that would be a good reason, in my way of reasoning. Congratulations on your awesome new book Lou, I love it! So much to digest and muse upon. I was a bit surprised to discover on reading the book a second time that there were huge chunks of the book that I have absolutely no recollection of reading the first time...weird! Every time I read one of your books one question continues to bug me. Why out of 7 billion people on the planet was I one of those few specifically guided to finding you and this info? I suspect on some level I do know but can't access or articulate the answer. Eevee, ignorance is bliss, and most people love bathing in bliss on a daily basis, their God and Allah given right to do so. Those billions living on political and religious cool aid, are so deep in delusions that they are indignant to anyone that challenges such delusions. The herd moves as one and despises the idea of individuality.